от 390 шт. — 69.60 руб. от 780 шт. — 67.70 руб. Добавить в корзину 130 шт. на сумму 9 126 руб. The EMILY series from LEDil, are a family of round LED lenses with 26 mm diameter. 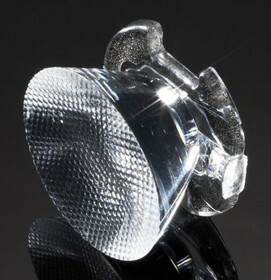 This range is designed for use with a single LED and come in a wide variety of options including clear or diffused. They also offer a range of beam angles from a spot to extra wide, and even an oval beam option. EMILY lens assemblies direct the light from an LED light source through the lens to achieve the desired beam emission type. Made using an optical grade PMMA, the EMILY lenses offer a high UV and temperature resistance. The lenses have positioning pins for location and they fasten in place with automotive grade PU foam adhesive tape. EMILY lenses have been designed and optimised for use with a variety of LEDs. Due to the rapidly changing nature of LED products customers are strongly advised to consult the latest manufacturer data for compatible LEDs. The viewing angle produced (the full angle measured at the half peak luminous intensity value) will vary depending on the chip size, colour and position of the LED.